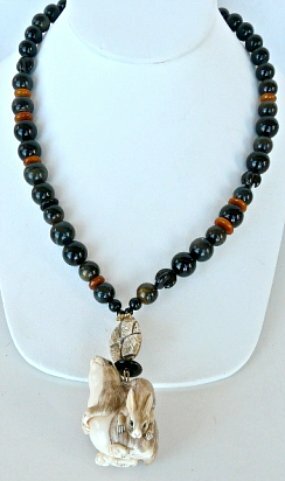 Approx 20" long, pendant 2 1/2"drop x 1"
This unique necklace is made with an old carved ivory mother and baby rabbit netsuke. The baby sits on the mother’s back. 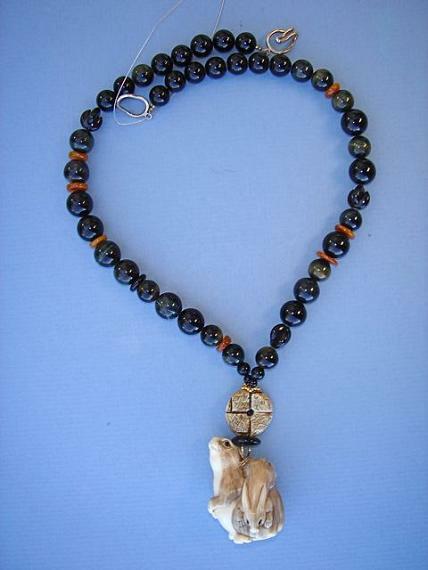 It is suspended from a carved bone pi and attached to a black onyx beaded necklace with some small red jasper spacers. It is finished with a 18k gold vermeil clasp. This is a conversation piece and will go with anything. The netsuke is a miniature carving, usually less than two inches high, created by Japanese and Chinese artists for over three hundred years. They portray every aspect of their life and culture, as well as characters from Japanese folk stories. These carvings were traditionally used to prevent the cord attached to a gentleman's medicine box or tobacco pouch from slipping through the belt of his kimono. Today, they are highly collectible works of art. Traditionally, netsukes have been carved from mammoth and elephant ivory, ebony, fossil walrus tusk, mahogany, rosewood and hippopotamus tooth. The netsukes, often signed by the artist, are getting harder to find as the detail in each piece takes patience and time and the younger Chinese are not so interested in pursuing this art form. . Many of these pieces are displayed in museums and demand high prices at art auctions - from a few hundred dollars to a few thousand depending on the quality of the carving and the artist.